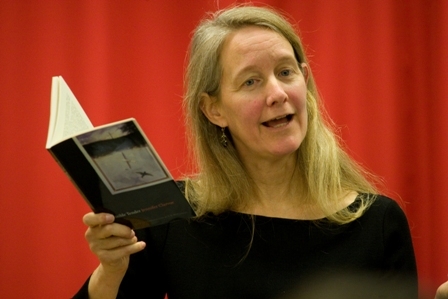 On January 23rd, ECLA was happy to welcome Jennifer Clarvoe, poet and professor at Kenyon College, to talk about Ovid’s Amores, one of the poetic texts for our core class Forms of Love. Jennifer’s specialty is twentieth-century American Poetry and her particular interest lies in poetic rhythm, and poetic form in general. True to her main interest and the topic of our class, Jennifer Clarvoe began the lecture by inviting us to think about forms of love and forms of poetry, and the relationship between them. Before the plenary session, we were given different translations of one of Ovid’s poems to prepare for a discussion of how language gives expression to the meanings the poet seeks to convey. What Clarvoe stressed is that Ovid himself invites such contemplation; in his poems he often highlights the question of poetic structure by matching form to subject matter. The question that Ovid’ s Amores addresses is what the forms of love are and how each of those forms, as Clarvoe suggests, “move and have their being” in poetry. She went on to explain that the forms themselves are paradoxical and “move” by means of paradox. Because the form remains the same, it threatens to become bound; to remain static and unmoving. Whereas our desire – with love, poetry, and language – is to move, to evoke a response or a certain change, therefore calling into question the static nature of the forms themselves. And so, the question we are faced with becomes the question of all language: what do we mean when we say: ‘I love you’? Surely most of us are tempted to say that the bird just reproduced mechanically certain phrases that he was taught. What is uncanny for us is that the parrot’s expression of love links to no emotional reality. This is also a problem with the expression of love and its language in human relationships: we want someone to tell us that they love us, but we also want them to mean it. But how do we know whether one truly means what one says? Jennifer says, “[to] explore the forms of love in language is to be vulnerable to being rejected and mocked; made and unmade by words.” This is also what Ovid’s poems offer us: the making and the unmaking of a man in words, one who is searching for the proper form of love, the proper meaning, and the proper language, in which this proper intersection of form and content can be found. Poetry always asks for response, and in terms of its language, we are the recipients of Ovid’s words and we are also the addressees of his poems. In the “light form” of language, in its playfulness, we find the gravity of the poet’s deepest feelings, his vulnerability in conveying the meaning of the words ‘I love you’. This is the ultimate form—the paradox: the playfulness of Ovid’s poems is “light”, but the responsibility to respond and to understand the meaning of the depth of sentiment is grave. The forms of love “move” by this paradox: they have to move us, the recipients, but not just with words; we have to respond with meaning to meaning.